Hee!Hee! You are not supposed to call them stray mongrels. They are the Indian breed which also includes the one in that Gandhian garb……can’t stop chuckling, nice one! 🙂 thank u ji so much !! 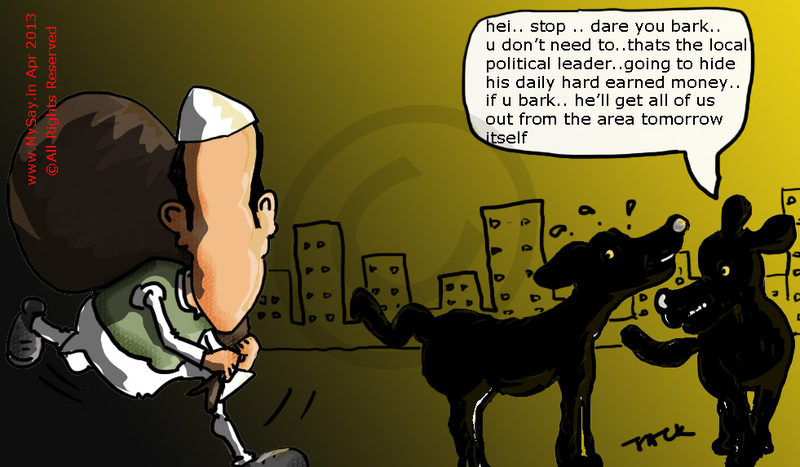 Funny situation , hard earned money of politician and dogs under control. Thank u Maulik … for all your appreciations .. thats the only food for a doodler like me … to help me and encourage me for better work .. thanks a ton for taking the risk of breaking office rules and hopefully it paid off !! 😉 thanks again for dropping by !! Very apt scenario. Well moulded metaphor. Specially considering the way the skeletions are falling in heaps from the political closets, I would say well timed too. intellect is just a matter of perspective I believe, but no harm in accepting compliments :). Keep up the drawing. Very apt scenario, specially considering the way the political dirty launrdy is falling out in heaps out of the closets. Well timed.